The Find My iPhone feature is pretty darn cool. If you inadvertently leave your iPhone in a taxi or restaurant, Find My iPhone may just help you retrieve it. The feature requires a MobileMe subscription. Tap the me.com e-mail account you added to the iPhone. You get a me.com e-mail account when you join MobileMe. In the me.com account screen that appears, tap the Find My iPhone setting if it’s not turned on already. Log in to your MobileMe me.com account from any Web browser on any computer. 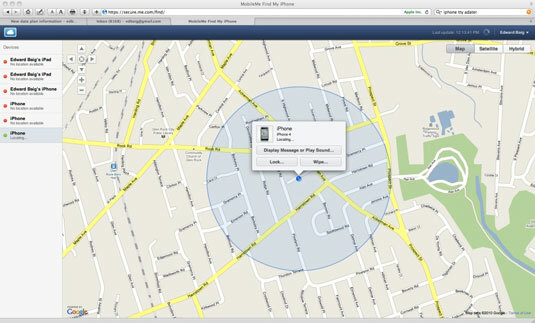 Assuming that your lost phone is turned on and in the coverage area, its general whereabouts should appear on a map. Apple supplies a free Find My iPhone app. So you could use an iPhone loaded with this app to locate another iPhone (or iPad). You still need a MobileMe subscription. After you log in to the MobileMe site, click Display a Message. Bang out a plea to the Good Samaritan who you hope picked up your phone and click Send. 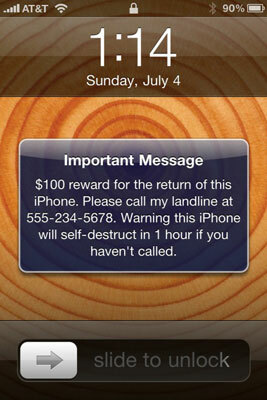 The message appears on the lost iPhone’s screen. Don’t forget to include in the message a way for the person to reach you. 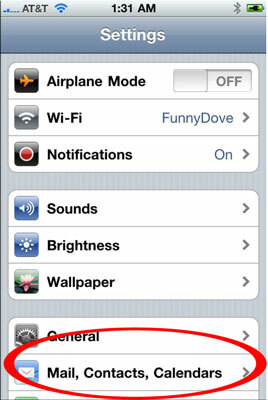 To get someone’s attention, sound an alarm that plays for two minutes, even if the phone’s in silent mode. Hey, that alarm may come in handy if the phone turns up under a couch in your house. After all this labor, if the phone is seemingly gone for good, click Remote Wipe at the MobileMe site to delete your personal data from afar and return the iPhone to its factory settings. And, if you ever get your phone back afterward, you can always restore the information with an iTunes backup on your PC or Mac.